You might think that kids don't appreciate beauty but I believe they can. If you don't like the word "beauty," use the word "awesomeness" instead. It's all the same. They may not be able to purchase works of awesomeness or create stunningly beautiful art themselves but like learning to cook amazing foods, the first thing you must learn is how to taste and really appreciate good food because then and ONLY then will you ever have a chance of making good food yourself. (Take it from me- My mom owned a restaurant for most of my life. I am okay in the kitchen but my taste buds have a PhD. in tasting Korean cuisine). This product was sent to Number 6 on the west coast. This was made by her using just five cards of the Flora set. Number 1 made this one. We had a contest PicWits! style. We tried to make an image that Grandma would pick. It was hard! It was nice to get to know her this way. Kaleidograph is definitely another senior-junior game. I asked favorite creativity expert, Petra Pankow, about the Kaleidograph and she explained to me the possible cause of my midnight mania. "I think there is possibly a delight in variation," she said. "It's just like having a task and being able to do it in many different ways." You just need two to make an image. 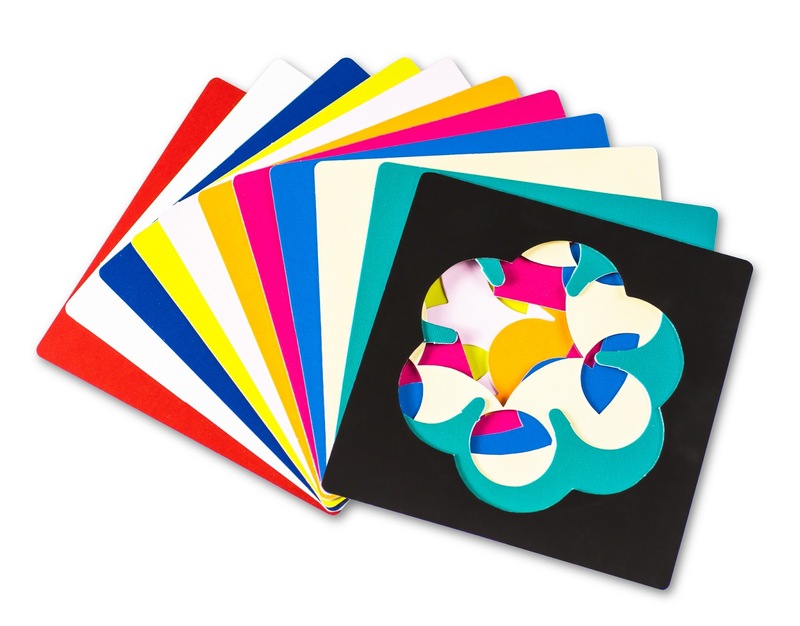 Nine die-cut cards and three solid color backer cards. Different colors on the flip side for all cards. This is the Flora Set. You don't have to get their acrylic frame ($11.99) but I totally recommend it! It is so thick and sturdy. I use it to make an image to express how I feel that day. It's a good morning mental ritual like ordering coffee at Starbucks. The Answers to Life are in a Kaleidograph? 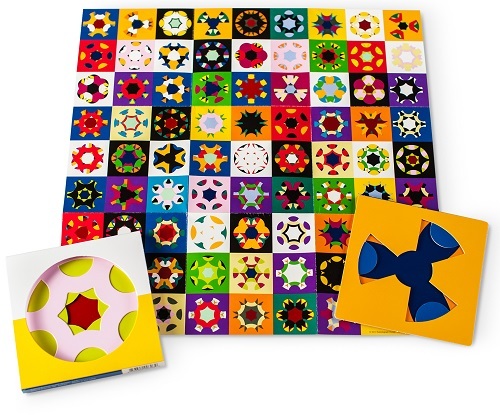 This seemingly infinite number of variations must be why this is a perfect math toy because math is a great example to show our logically-minded kids how there is more than one way to get to an answer. Petra also noted that the Kaleidograph was extremely open-ended. "There isn't really a beginning and an end and so you're never done with it." Number 6 while waiting for sushi. 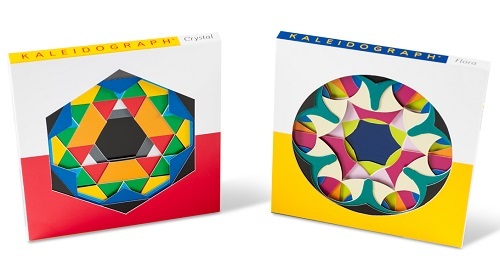 It's very interesting to me to see adults have a harder time finishing their Kaleidograph than children do. This is my observation so far. I can sit there for a long time but some kids make it and are done with it. But then, if you put both children and adults in a social sharing situation then something different happens. Both sides want to share what they made! Thus, I find it such a great social scene helper because when you make a beautiful thing, the natural human instinct is to share it. Thus, if you do decide to get this, I hope you buy two, if not, please try to have it shared because you can see that it's possible to make something amazing with just 3 plates. It's also very beautiful." Petra said. "It gives you a set of tools that everybody can handle - you don't need any sort of skills." This is the Crystal set. This is the Flora set. Did you learn what rotational symmetry was in school? I think maybe I did but I don't remember when. I loved geometry class in high school. I think I love the drawing aspect of it. It's so hands on! This might be why my son likes Kaleidograph. Or he might like it because he loves math! He especially loves symmetry. I see it in his LEGO designs all the time. Yes, all the blaster tanks and aircraft bombers are perfectly symmetrical. If you don't quite know what rotational symmetry is, you are not alone. I had to look it up myself. I think kids may also know what it is but it's good to be able to define it in words. According to a fun website I found: MathisFun.com, rotational symmetry is when a shape or image can be rotated but it will still look the same. But there are orders.... An Order 3 - Rotational Symmetrical design means that you can match it three times as you rotate the image one whole time. 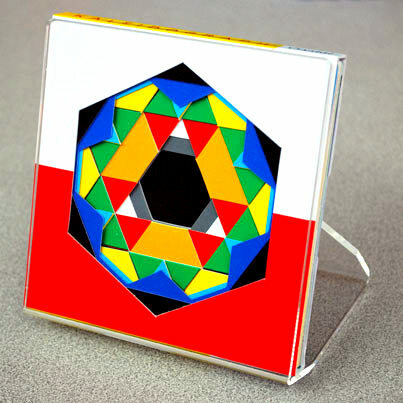 The Kaleidograph is actually an Order 3 rotational symmetry. Rotational Schmotational, My Kid is Only 7! I totally understand but the cool thing is that rotational symmetry is everywhere and it's neat when you and your kids become really conscious of it, especially when you see it in nature! Also, while I highly doubt that anyone who reads this site solely relies on the state tests to plan their child's education, I think it is safe to say that there is no reason to be overwhelmed. Additionally, I bet lots of super mathies feel that way about math. You can be both complex and simple about math. It's up to you. Again, you can make the same argument for food, like sushi. Like symmetry, sushi is rather simple. There is no need to be complex about it but I love sushi and sashimi and everytime I eat it, I consider it a gift. To me, good sushi is delightfully complex. If you really love sushi then you probably know that this kind of appreciation was built over time. Some foods are better than others and some toys are better than others. When you have the Kaleidograph, if you give it a chance, you will see that you can build an appreciation in not only your child but yourself as well. It's a toy for the whole family. You can teach your kids to play fancy tricks on the computer with simple designs. It's easy to understand what all the fancy buttons do when you have something simple to morph. I can't remember if this was my idea or his but using part of the stencil was definitely #1's!!! But seriously, Kaleidograph and eeBoo Scratch Papers are very perfect match. They are both perfect squares too! 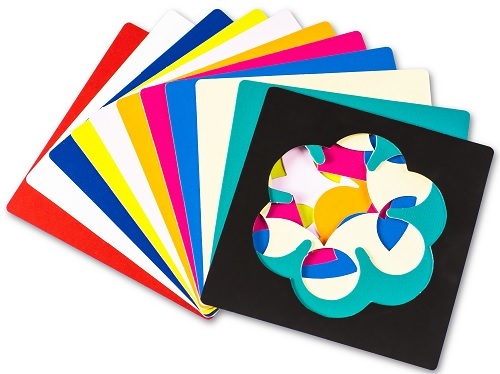 I hope eeBoo Scratch Papers and Kaleidograph will be displayed right next to other in stores. I wouldn't want anyone to miss this idea. This is so perfect for summer and Kaleidographs travel well! 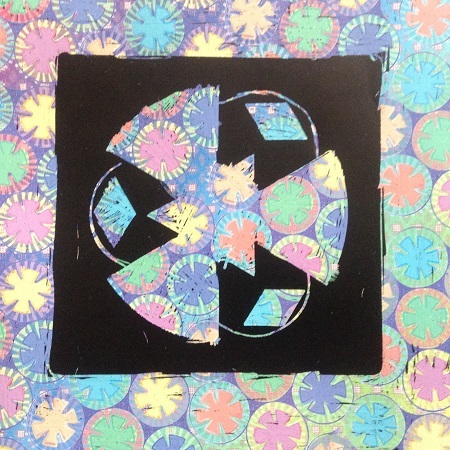 Here is another example of tweaking when using Kaleidograph on eeBoo Scratch Paper. 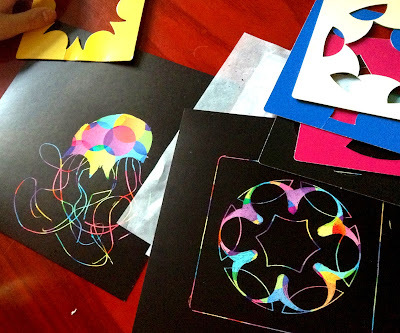 If your Kaleidograph papers get too bendy ('tis paper after all).. try using them with smooth colored pencils or gel pens. I used Prismacolor. Thank you LDG for the recommendation! Those pencils are smooth!- LIKE BUTTER! Remember to draw a square to establish location! I love the colors he chose. PLAY ONLINE- you can do it for the giveaway or just do it to share. see details below! And btw, you can literally make a design and then order a t-shirt. Totally fun and only $12. Seriously! And now try out to win a your own set of Flora and Crystal Kaleidographs! BUT first please do me and yourself a giant favor and LIKE the Kaleidograph Facebook Page and FOLLOW their Twitter Page. This is a young company led by real veterans of the toy industry. If you take a look at Red Hen, you'll see a really fearless selection of toys that inspire curiosity, stay informed and LIKE and FOLLOW them. Want to get it on Amazon? Use Amazon links to support Toys are Tools or buy it at a local retailer. Also: Cool Math Activities you might have never seen elsewhere at the MoMath website. I highly suggest the Tumbling Tetrahedra and the Hexa-Tetraflexagon. Card stock is best. We love our other toys from Quercetti! 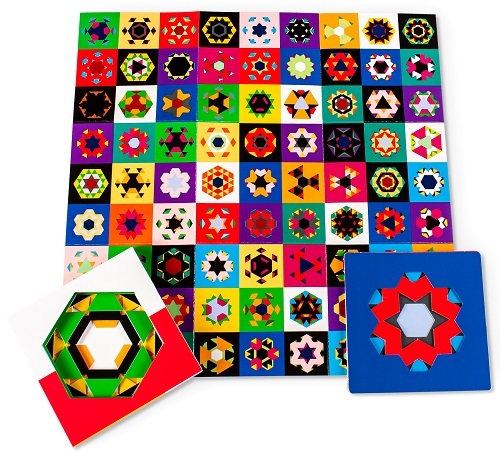 I've seen the Inchimal Math Blocks before and wondered if they were a good toy.